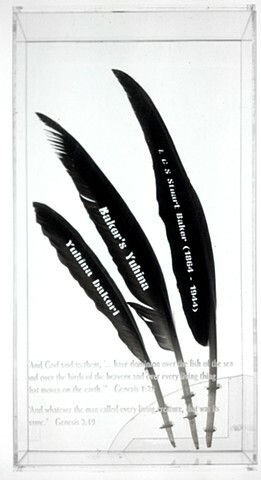 16" x 10" x 2"
Plexiglass box containing Canada Goose feathers laser cut with the names of ornithologists who have named a bird species, the species name in English, and the scientific name. This series in progress works with the idea that in our arrogance, and given permission to do so by the Bible, we impose our names upon species that we have discovered (as though our becoming aware of them brings them into existence). "Nom de Plume" is a double entendre, referencing both the idea of a pen-name, and that of the literal feather as a writing device.